To some extent, we didn’t realize what we were getting into when we decided to buy half of a pig. We didn’t get some of the cuts that we wanted – we got the meat, but not processed the way we requested. We opted not to get specific cuts smoked because we’d planned on processing them ourselves – except that we can’t really do that because we didn’t get the cuts we requested. The net result of this is that we have a lot of fresh ham, and no idea what to do with it. This was my first attempt at doing something with one of the larger ham cuts. I’d done some internet research, and hit on this recipe, which called for fresh ham but didn’t require special equipment. Shane worried that there might not be enough acid, but I was confident in the acidity of the soda – it breaks down teeth! – and so let the crockpot full of ham and sugar do its thing all day. 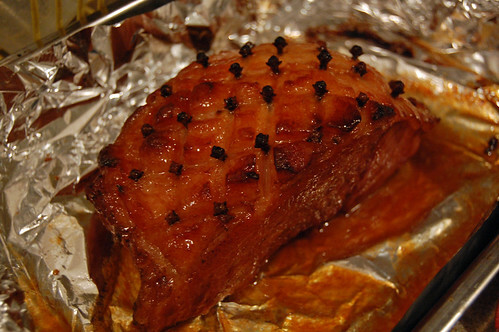 Sure enough, by dinnertime the acidity and the liquid had done their jobs, and the ham was completely falling apart. No pink glazed goodness for us, oh no. More like a very sweet pulled pork. Better luck next time, eh? This time, though, we had the ham with a roasted radish salad, polenta cornbread, and a big rye beer. For dessert, a rough pear crumble and a bit of Matt and Shannon’s pawpaw ice cream. For a dinner comprised entirely of recipe experiments, I think it was a success! < Previous 0925 Corn Chowder and an Attempted Robbery!